Hold your conferences and meetings at Schlossgut Oberambach, one of the “best conference/meeting hotels in Germany”. South of Munich, we offer you enough space to unfold your creativity and productivity. The special atmosphere and the holistic ecological concept of the conference/meeting hotel makes your seminars, company celebrations and conferences special experiences. The 4 conference rooms, group rooms and the castle grounds of the property accommodate up to 99 people. Extensive service and modern technology complete your event. Our hotel offers the perfect setting – from culinary highlights to relaxing wellness options. Host your meeting in one of the top conference/meeting hotels near Munich. We will give you support throughout the entire planning process and make your wishes come true! While being inspired by the atmosphere Schlossgut Oberambach, everything “behind the scenes” runs like magic. Our team will be at your side with professionalism in order to ensure a smooth process. All conference rooms benefit from bright daylight and are partly air-conditioned. In addition, we offer you all the equipment and communication solutions you need for a successful event: WiFi in all seminar rooms and public areas, as well as a wide range of professional conference technology, such as projector and presenter case, are obviously included it the price. Additional technical equipment and tools are also available on request. Environmentally conscious conferences at Schlossgut Oberambach: Unfortunately, most conferences and events have a very bad ecological balance. At our conference hotel, sustainability and environmental awareness are part of our philosophy. 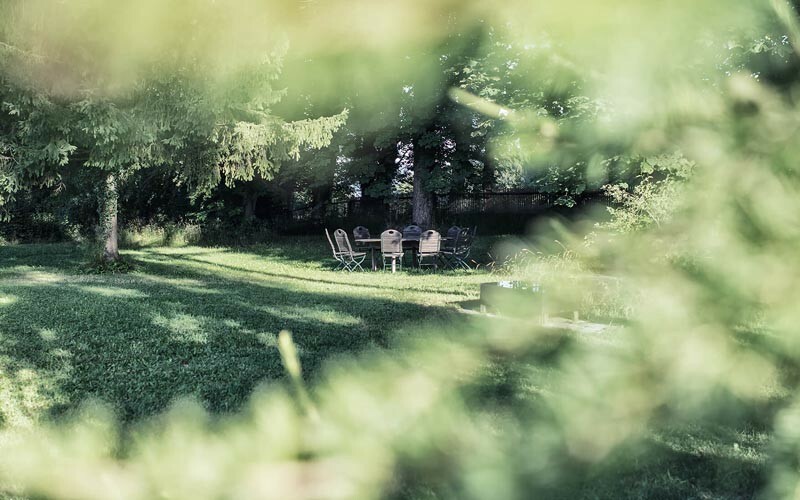 Schlossgut Oberambach, one of the “best conference hotels in Germany”, is managed in an ecologically friendly way – we pay attention to environmental concerns down to the smallest detail. 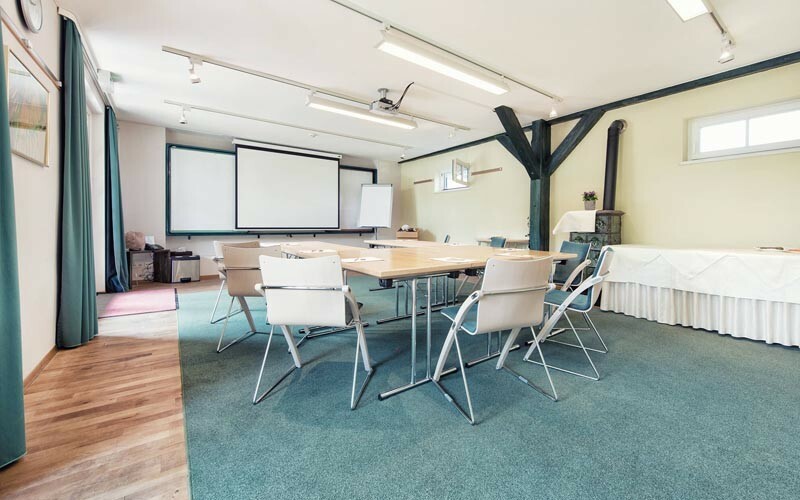 Help to make your conference environmentally conscious – hold your meetings at Schlossgut Oberambach. Our meeting room “Starnberg” is located in the main house on the ground floor. The room has a size of 115 square meters, has 6 windows and a wide double door with dark curtains. It is subdivided into “Starnberg A” with 75 sqm and “Starnberg B” with 40 sqm. The conference/meeting room “Bernried” has a size of 52 square meters and is located in the main building, 2nd floor. It has 6 roof windows. A glass double door with wooden rosette and a Catherine glass double door facing east lets more daylight shine in. The meeting room “Ambach” is located in the adjoining building and has a size of 44 square meters. Two glass double doors facing south let sunlight shine in. A visual wall with 6 pinboard elements and a screen are an integral part. 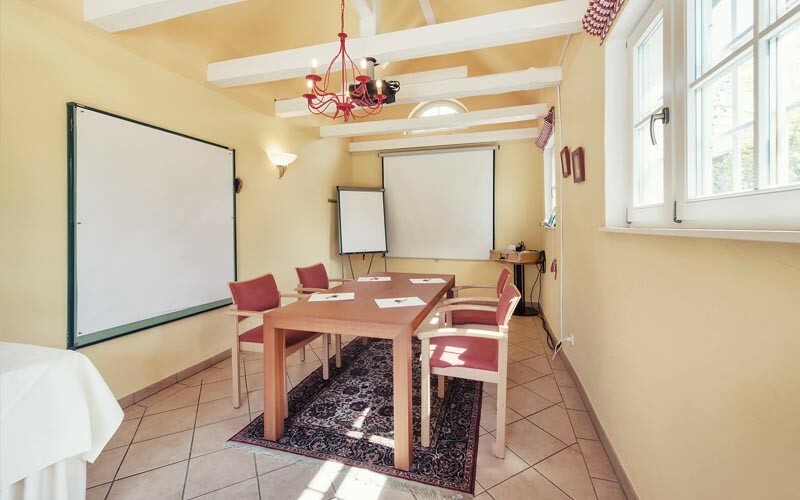 The meeting room “Tutzing” is located in an adjoining building. It has a large terrace door and two windows facing south. It is 16.5 square meters in size and has a room height of 3.20 m, which makes it very bright and friendly. 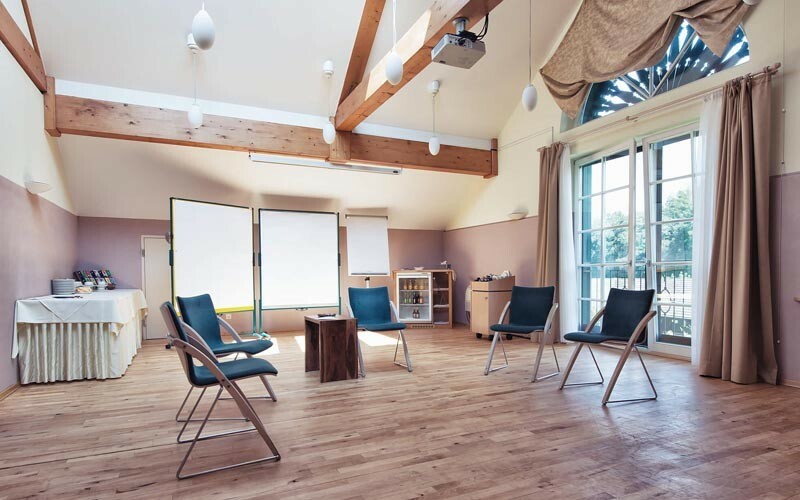 The room is perfect for a coaching with 2 to 4 people. In good weather conditions and depending on technological requirements and seating, your meeting can take place in our spacious castle grounds. We offer you a separate area in the castle grounds to ensure a peaceful and undisturbed working atmosphere. In order to be able to work peacefully and undisturbed, we reserve a separate area for you. With individuality, heart and thoughtfulness, we will fulfill your special wishes and contribute to the success of your event with an unusual supporting program. Further conference equipment on request and via booking in advance. All prices listed here already include 19% VAT.